by unknown hand, lower center on parapet: IOANNES BELLINVS P.
Walter Wysard [b. 1871], Pangbourne, Buckinghamshire; purchased 1921 by (Duveen Brothers, Inc., London and New York); sold to John R. Thompson, Lake Forest, Illinois, by 1924; (Duveen Brothers, Inc., London and New York); sold 1940 to the Samuel H. Kress Foundation, New York; gift 1943 to NGA. Duveen Brothers. Duveen Pictures in Public Collections of America. New York, 1941: no. 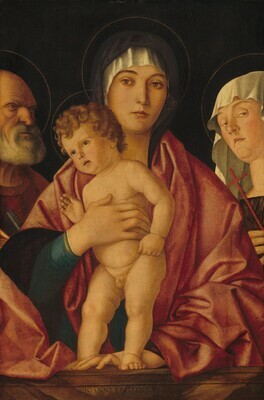 86, repro., as The Madonna and Child with St. Peter and St. Clara by Giovanni Bellini. Preliminary Catalogue of Paintings and Sculpture. National Gallery of Art, Washington, 1941: 22, no. 538. Book of Illustrations. National Gallery of Art, Washington, 1942: 250, repro. 71. Paintings and Sculpture from the Kress Collection. National Gallery of Art, Washington, 1945 (reprinted 1947, 1949): 92, repro. Einstein, Lewis. Looking at Italian Pictures in the National Gallery of Art. Washington, 1951: 74-78, repro. Paintings and Sculpture from the Samuel H. Kress Collection. National Gallery of Art, Washington, 1959: 136, repro. Shapley, Fern Rusk. Paintings from the Samuel H. Kress Collection: Italian Schools, XV-XVI Century. London, 1968: 44-45, fig. 107. European Paintings: An Illustrated Summary Catalogue. National Gallery of Art, Washington, 1975: 22, repro. Shapley, Fern Rusk. Catalogue of the Italian Paintings. 2 vols. National Gallery of Art, Washington, 1979: I:58, II:pl. 33. Walker, John. National Gallery of Art, Washington. Rev. ed. New York, 1984: 203, no. 243, color repro. European Paintings: An Illustrated Catalogue. National Gallery of Art, Washington, 1985: 42, repro. Tempestini, Anchise. Giovanni Bellini: catalogo complete dei dipinti. Florence, 1992: 178, no. 61, repro. Boskovits, Miklós, and David Alan Brown, et al. Italian Paintings of the Fifteenth Century. The Systematic Catalogue of the National Gallery of Art. Washington, D.C., 2003: 84-87, color repro.